The Perth Royal Show started it's days as tenant at Claremont Showgrounds after a deal was made with the Western Australian Government to swap land at Guildford for a home at Claremont, closer to the city. This was under the banner of the "Fair and Cattle Show" as it was previously known. 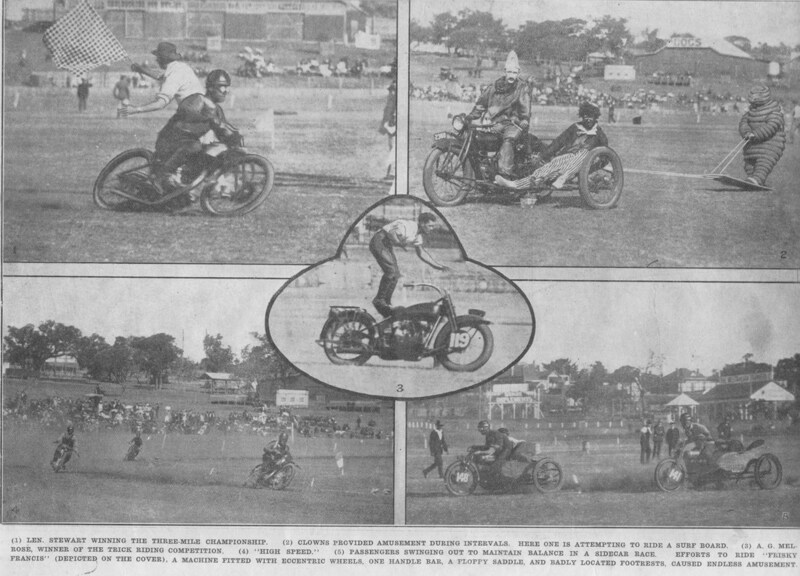 During these early years Motorcycle grass track racing events were held on the grand arena during the course of the show. Prior to this Speedway events were held at the Twin Bridges Speedway (It's name coming from what we know as the causeway over Herrison Island) and the Arena we know today as Glouster Park, The first Metropolitan Speedway held in Perth. Allan Baker recalls: It was not uncommon for Shows to hold car and motorcycle events such as grass track racing and novility events, This was the age of the car and bike clubs, with the aid of Societies and Associations holding meetings under there own direction. 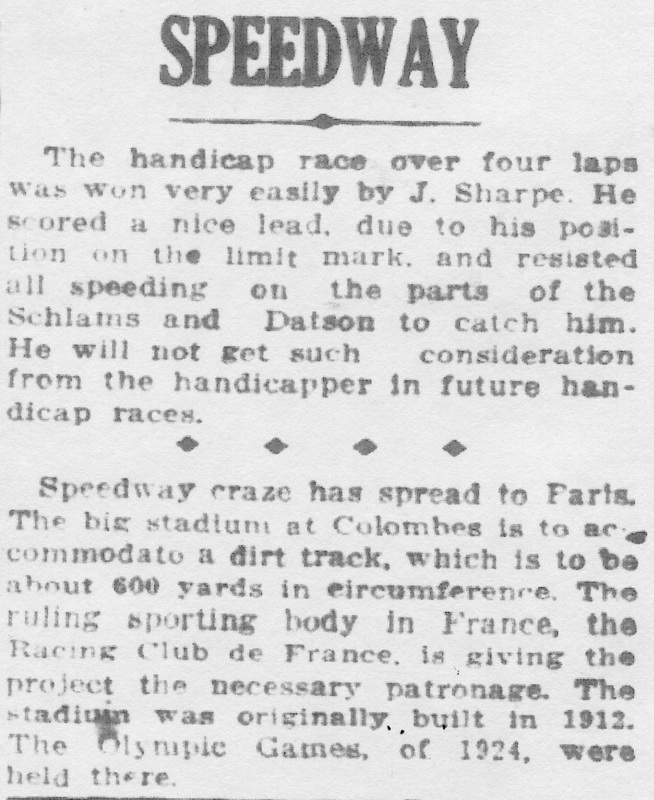 The Age of the professional Promotor didn't hit Claremont until 1927 when racing on the grass track was seen as a means of profit for any enterprising promotor. For almost a year Claremont saw no racing as competition moved to Perth Oval. 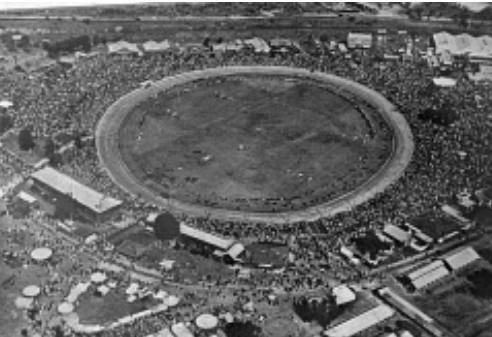 After construction of a dirt track around the perimeter of the oval, on May the 14th of 1927, Johnny S Hoskins, would professionally promote the first dirt track Speedway meeting on the Claremont Showgrounds. For seventy three years Speedway would reside at the Showgrounds until it closed on the 31st of March 2000. On Saturday afternoon next at the Royal Show, a motorcycle race of three heats and a final will be run. The sum of ten pounds has been donated for the prizes and there are a good number of entries. On Friday afternoon the motorcyclists will amuse the public with an obstacle race and a pairs race on the same ground. 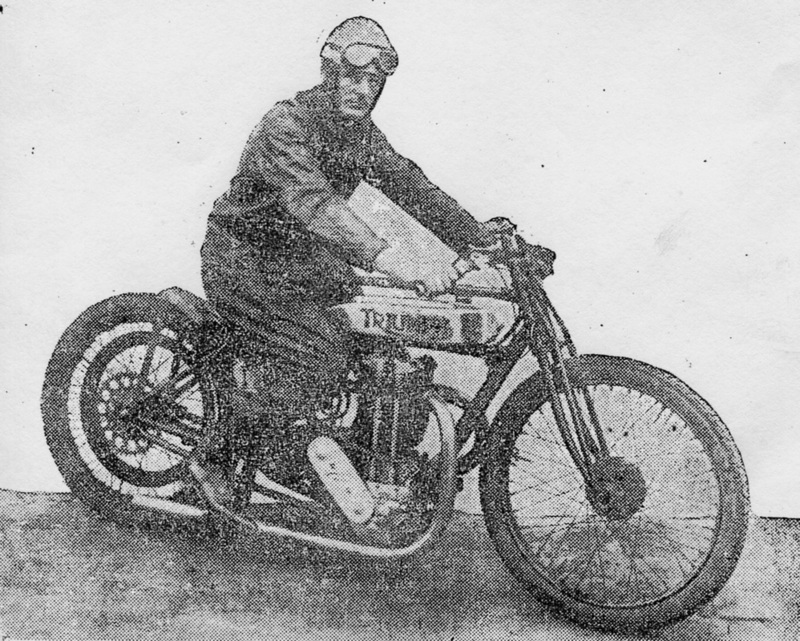 Ossie started riding in 1917 and won his first championship in 1919, he went on to win a further five before a bad crash forced him to retire from motorcycle racing in 1923. NSW. rider and the machine - a Triumph two-port TT model - on which he won the special match race from Stan Catlett at Claremont at the final night meeting of the season. The above picture was taken at the start of the race yesterday week, The winner, Stan Catlett was on the extreme left at the start and could not be included in the illustration. Competitors in an event awaiting the starting pistol at the speedway, Claremont, last Saturdayafternoon. On the outside is Stan Catlett who, riding a 2 3/4 Harley Davidson performed brilliantly during the day. Bernard Perrie was the first death recorded at the Claremont Speedway. The accident and death date is recorded as the 31st of December 1928. Claremont Showgrounds was the home of Claremont Speedway from May 1927 to March 2000. at the point of closing Claremont was one of the longest running speedway's in in the world. John S Hoskins was the first promoter, also was Aub Lawson solo champion and Perth business man Jim Davies, not to be confused with Jim Davies, the great sidecar rider, Con Migro the final promoter ran the speedway up until it closed and then later went on to become the first promoter at the new Kwinana Motorplex. After the lights were installed on the tenth of September 1927 it is claimed that crowds of up to fifteen thousand people attended Claremont Speedway on a regular basis. Legend has it in 1923 John S Hoskins the secretary of the Maitland Show Society NSW young locals racing and sliding there motorcycles around in farmers paddocks. 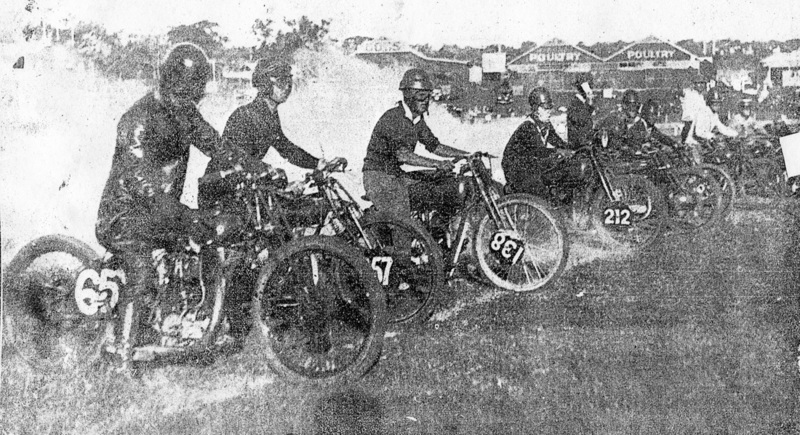 John organised some of these riders to put on a show around the trotting track at the Maitland Showgrounds, in 1923 the Maitland Showground held their first motorcycle racing event. This became the birth of motorcycle racing in Australia, from there John took the concept to Newcastle, Sydney, and Perth. The first Perth event was on the 14th of May 1927, Claremont's opening night. 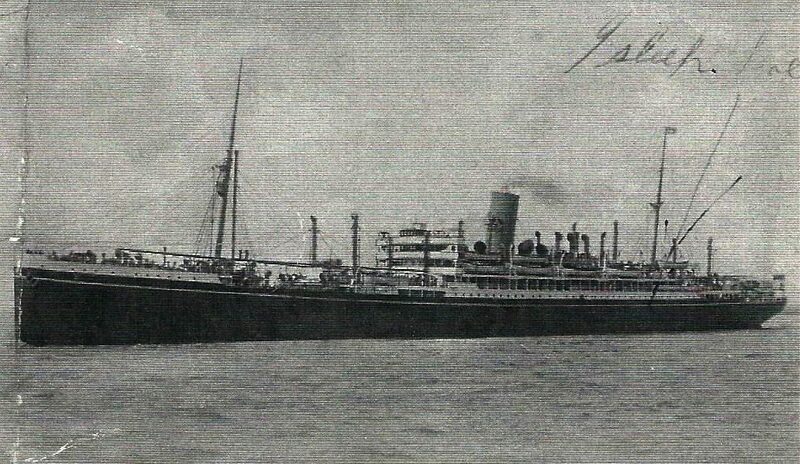 Such was the interest generated from this idea of Hoskin's that on the 10th of April 1928 the ship Oronsay steamed out of Fremantle with thirteen Australian solo riders on board with their bikes to introduce solo speedway racing to England. Later the sport spread to Europe and then to America, Hoskins was awarded the MBE in the 1979 New Years honours list for his services to speedway. While in England Hoskins either promoted or co promoted many clubs including Ashfield Giants, Canterbury Crusaders, Bellvue Ace's, Obsal Boomerangs, Edinburgh Monarchs, Fife Lions, Newcross Rangers, Newcastle Diamonds, Glasgow Tigers and the West Ham Hammers. Johnny Hoskins not the inventor of speedway but the man who made the whole world aware of the sport. Sig only raced in England for about three months in 1928, in that short period he impressed the crowds with his spectacular riding, riding his Douglas machine he appeared at several of the London tracks as well as White City, Manchester and Salford Albion. Sig Schlam would die in 1930 after crashing into the outer track fence at the Perth WACA ground. soon after speedway racing returned to the Claremont Showgrounds. Sig Schlam won the Australia Dirt Track championship in 1927 at Claremont Speedway, he is pictured here on the original large Claremont track prior to being reclaimed for seating, the bike is a 350cc Harley Peashooter. Harry Baker or Cannonball to his friends, was one of the original solo riders to race on the big Claremont circuit when it opened. Harry was the enaugral winner of the Claremont Speedway Silver Gaunlet and was also credited with being the first rider to top 100mph. Harry's true passion however was in aviation that consumed his entire life, a stroke would later incapasitate the once great rider in the seventee's and he would later pass away in 1986. 1928 - Syd Parsons on his AJS machine on the big Claremont Speedway track. Photo: unknown. Jack Sharpe from South Australia. Photo: Brian Lee collection. Percy Mulligan was the 2nd death recorded at the Claremont Speedway, he was a solo motorcycle racer, he died on the 2nd of March 1929. Frank Brown was brought to Perth to take on the youngster from Yarloop Sig Schlam. Photo: unknown. Johnson took such a sharpe turn right that his passenger was thrown out and received a badly cut face and hands, and had to be taken to hospital. Johnson was unable to stop for 35 yards, and when he got out he held onto the motor car in order to stand upright, He was arrested on a charge of drunkenness and kicked Sergt, Bullock when going to the Police Station. A Doctor refused to certify to drunkenness, and the Magistrate remanded Johnson on the other charges to enable him to secure proper defence. The Magistrate added that the authorities ought to concider charging Johnson with an indictable offence. Ronald Johnson an Australian Speedway rider, was charged at the Marlborough-Street Police Court with dangerous driving and assaulting the Police. Sargeant Bullock and a constable gave evidence that Johnson drove a sports car over the Serpentine Bridge, Hyde Park, at a Terrific speed, cutting in between two cars which were forced to pull up. Johnson was familiarly know locally as "Jarrah Jerker" Johnson for he formerly worked among the jarrah in the South West of this state. 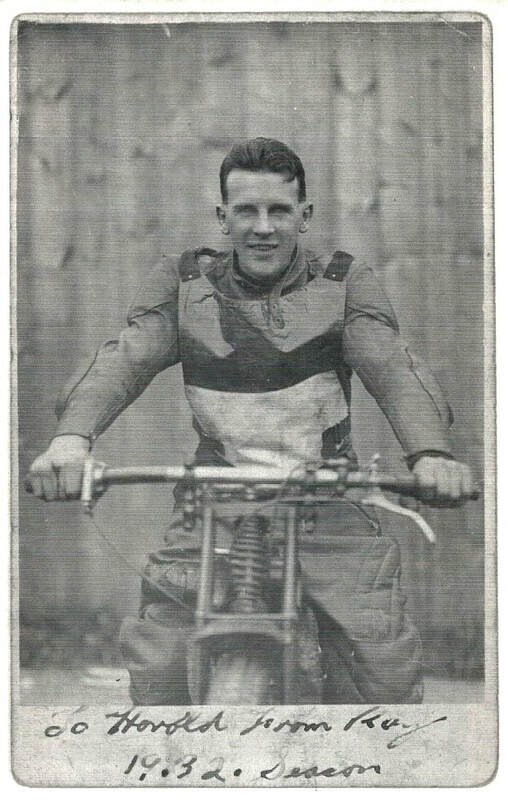 Australian International rider Ray Taylor from New South Wales paid for his passage, left his family and steamed to England onboard the SS Moreton Bay to race in the booming motorcycle speedway sceen. While away Ray kept in regular contact with his brother Harold, sending photos and news about his racing home. Ray or "Broadside" as he was known as because of his riding style soon became a well known rider in the Wimbleton League. Ray rode on for years with a scar under his right eye, the result of a cheek bone fracture caused by an accident at Liverpool Speedway. 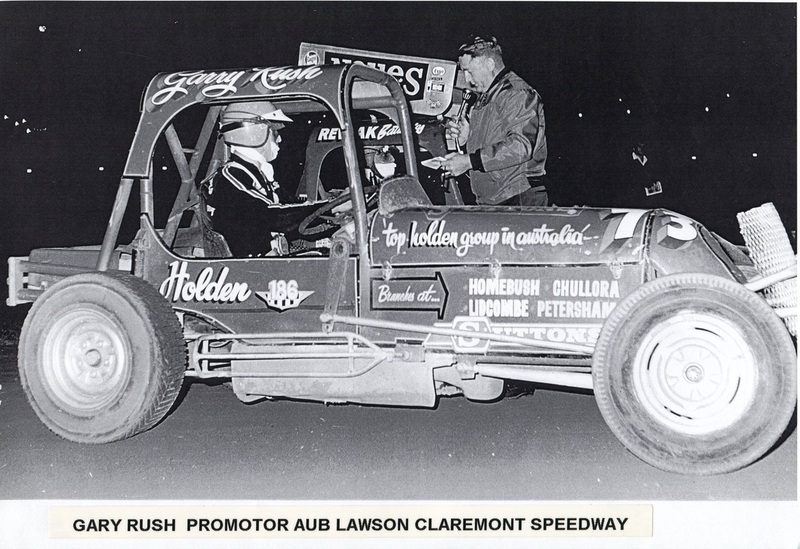 Aub Lawson was the managing director of Claremont Speedway for many years, he took over Claremont after a recession period and returned it to its former glory. Aub's riding career began around 1936 on a bike borrowed from Vic Hibbard at Shepherds Bush NSW, He then bought a Rudge and showed enough promise to be signed up to ride at the Sydney Showgrounds. Later he sold the Rudge and bought a JAP machine that gave him the ability to become one of Australia's top riders. Aub left for England in 1939 to ride for Middlesborough and later Wembley where he teamed with Lional Van Praag, they went on to win the World pairs tital. At that point war broke out and Aub put his speedway on hold and joined the war effort in Borneo and Singapore. After returning from the war Aub started racing again and in 1957 he became captain of the West Ham team and won the British match championship two years running, he retired briefly in 1951 but retuned two years on to captain Norwich in the 1959 world final, he finished third. By 1960 Aub at the age of forty five returned to West Australia to manage Claremont Speedway, also becoming a partner in the running of Sydney's Westmead Speedway during the winter months. 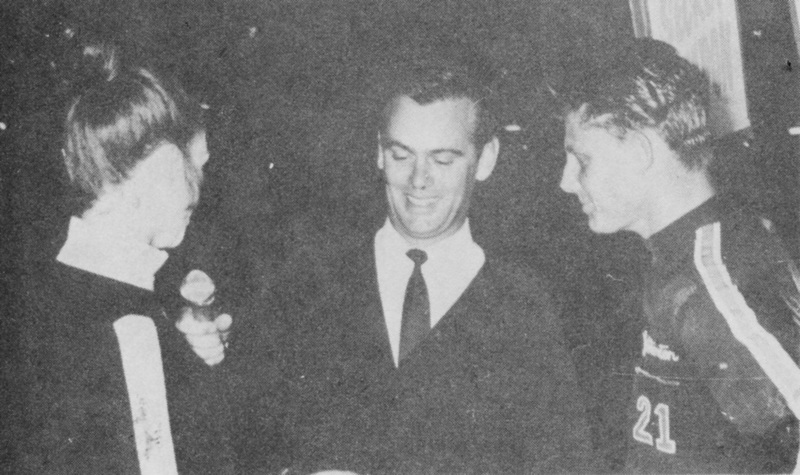 Aub still riding went on to win the 1963 NSW solo tital at Kembla Grange Speedway over Jim Airey and Gordon Guasco, Westmead closed in 1968 and Aub returned full time to Claremont, As time passed under Aub's leadership a very capable young apprentice in Con Migro began to emerge to later take control of Claremont and the later in the year 2000 the Kwinana Motoplex. The great Aub Lawson passed away in 1977 at the age of sixty three. 1966 1967 - Con Migro and Geoff Stanton make a presentation Photo: unknown. 1968 - Aub Lawson helped many riders to get the chance to ride in England, one of these great riders was Les Sharpe (nealing). Aub looking completely relaxed with his wife Roma and baby in arms. Photo: Les Sharpe collection. Ronald Deas who was a solo motorcycle racer at Claremont Speedway lost his life after an accident and died on the 27th of Febuary 1937. Neil Shiller also a solo rider would join Ronald Deas as a death on the big Claremont Showground track in 1937, Shiller's death is recorded as the 18th of December 1937, his was the fourth death in the history of the Claremont Showgrounds.